The supercontinent of Pangea formed some 270 million years ago, during the Early Permian Period, and then began to break up 70 million years later, eventually yielding the continents we inhabit today. 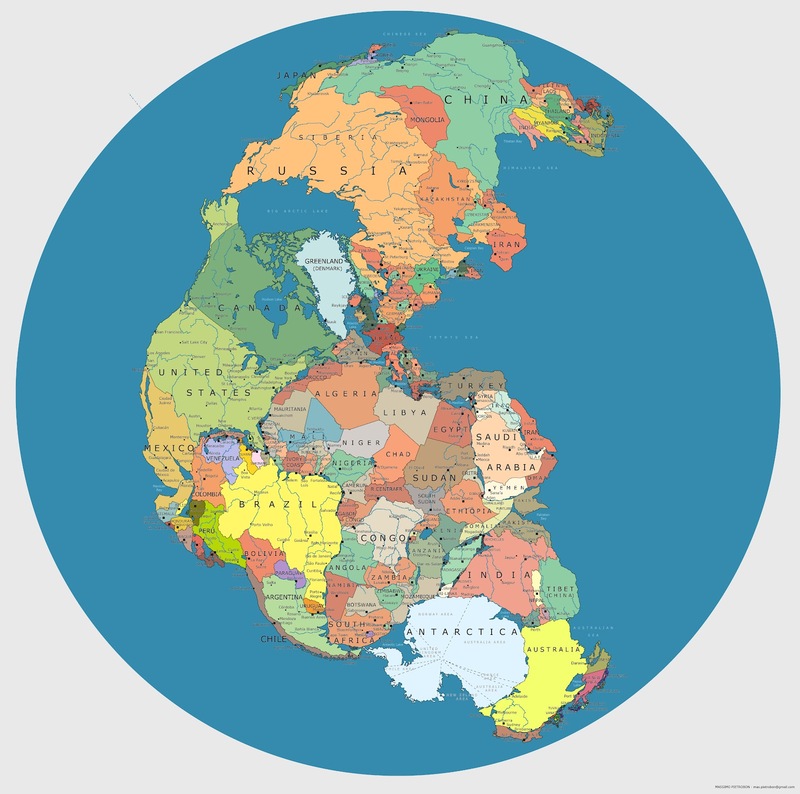 Pangea was, of course, a peopleless place. But if you were to drop today's nations on that great land mass, here's what it might look like. (Click on the image to view it in a much larger, high resolution format.) The map's creator is Massimo Pietrobon, someone who playfully describes himself as "a famous explorer and cartographer of Atlantis," and who has taken on other experiments with maps in the past. When someone claimed that the scale of certain countries wasn't exactly right, Massimo was quick to confess on his blog, "Yes, it's just a trial, it can be better." But it's a creative start. May you and your family enjoy this special occasion together, peace and blessings be upon you all. I would like to say something about Kurdish country, it means Kurdistan. Kurdish people have been the earth when God created people. on the other hand, huge ethinc do not have their own country. If you pay attention past histry, you will find Kurdish country on the map. Today, it depends on what kind of world representation (Winkel, Mercator projection, Pacific-centric, Mollweide…) you choose. Although the vast majority of maps all over the world are Euro-centric. But, looking this map, then and now, Europe was the center of the world! What a great idea. Thanks for sharing this. Fascinating image! Don’t let the other primates get you down. We all know the world went to hell in a handbasket the day it lost the trilobites. Marking out the equator and poles would be helpful in guesstimating the various climatic zones. There’s a map here: http://www.cmmap.org/learn/climate/paleo5.html which gives an idea where Pangaean poles and equator were. This is pretty stupid if it’s just based on current shape of continents and nothing substantial such as geological substrates and plant/animal distribution. Where would jamaica be located if pangea was still together?